Strike by doctors ,what are your views? Strike by doctors, what are your views? Strike by doctors is always controversial worldwide as views differs on whether doctors should go on strike. The problem in most cases is that strike by doctors is only seen as being caused by doctors. There is sadly a failure to listen or to look at the root cause of the problem. In some countries like Zimbabwe , you find that the leaders of doctors are either arrested or suspended when strike by doctors take place. There is a general consensus internationally that emergency care should always be provided during a strike by doctors. However other considerations also come into play when doctors consider the justification for a strike. The doctors’ leaders are often accused of inciting other doctors to go on strike . Who is the culprit in these situations , doctors or the government? Suspending or arresting the leaders is similar to a father who beats a child because he complains that his school fees is not paid. We know who is supposed to pay the fees. If the father squandered all the money meant for fees at the night club or at the “small house” then beating the child is not the solution. The solution is for the father to take his responsibilities seriously and deliver and not to divert attention by accusing the children for being disrespectful towards him. The child is just highlighting his predicament that he cannot go to school if the fees is not paid . The same applies if doctors are hungry they cannot go and care for others. We need to first care for them so that they can care for others. I welcome the intervention by the Minister of Health in Zimbabwe Dr David Parirenyatwa on the dispute between four Parirenyatwa doctors and the Health Services Board (HSB). HSB suspended the executive committee members of the Zimbabwe Hospital Doctors Association (ZHDA) on the 5th February 2016 on allegations of inciting fellow doctors to go on strike.The members suspended are Dr Fortune Nyamande (president), Dr Hugh Manyere (vice president), Dr Gadzirai Edson Makoni (secretary general) and Dr Rusununguko Kanyongo (treasurer). A look at the United Kingdom first. On the 23rd February 2016 the British Medical Association (BMA) announced that it is now set to launch a judicial review . This follows the embarrassing revelation that the UK government appears to have failed to undertake an Equality Impact Assessment (EIA) prior to its decision to impose a new contract on junior doctors in England. In trying to push through these changes, the government is sad it to have failed to give proper consideration to the impact this contract could have on junior doctors. The judicial review will seek to overturn the decision to impose the new contract and provide a declaration that the secretary of state had acted unlawfully. The GMC does not only address the doctors but also raises the issue of strike by doctors with the employers. Employers have responsibilities that they must not neglect. These include making sure that rotas are designed to minimise the adverse effects of fatigue and workload. Not forgetting to make sure that any patient safety concerns are acted upon immediately. Doctors must also be protected from unfair criticism or action, including any detriment or dismissal. I remember in 1998 doing orthopaedics as a junior doctor at Harare hospital in Zimbabwe. I would be on call from Friday to Monday afternoon without any break. One night a patient I was suturing his wound reminded me that I was dosing. I had to go and take a quick break but I could not rest for much longer as I was called back to the ward. I lost any patience left with our health system in 1999 when I was doing my paediatric rotation. Paediatric on calls at Harare Hospital were very busy and after working 48 hours non stop I was exhausted. I went to my on call room to take a nap and I overslept only to be awaken by a bleep. It was my registrar ( middle grade doctor) who was calling me for the ward round. He was on call with me but did not have to stay in the hospital . I had to call him if I needed senior help and that night I had not called him as I managed to deal with the children that came during that shift. The registrar was not happy that I was late for the ward round. He also got angry when I told him that I was very tired. He reported me for ” being tired” at work to the head of paediatric department and I was punished by being asked to do another three months of paediatrics rotation. That year the whole health system continued to collapse and at one point we had no gloves to use. We would hide the gloves so that we had something to use when carrying out our duties. We decided to down our tools and this was a last resort and no one persuaded or incited me to do so. The state of our health system forced every doctor to down their tools. The doctors did not need anyone to incite them and I do take offence with the suggestion in Zimbabwe that doctors are incited by certain people. In view of the problems in our health system in 1999 we went on strike from September to the first week of November. Our industrial action coincided with the launch of the first strong opposition party in Zimbabwean history -MDC. Our strike gave the opposition free publicity as they highlighted our industrial action as an example of the collapse of the health system. Surprisingly no one from the opposition approached us but the government became paranoid suspecting that we were being supported by the opposition. I remember the then doctor’s leadership trying to call off the strike but we refused. I was very vocal in that meeting and we also travelled to Bulawayo to show solidarity with our colleagues there but we were outsmarted by the government intelligence. One by one we started to go back to work without achieving anything. I realised that it was time to broaden my horizon and look west ! The rest is history so they say. Today I am sadly compiling this article as a local of south kent coast in the United Kingdom. 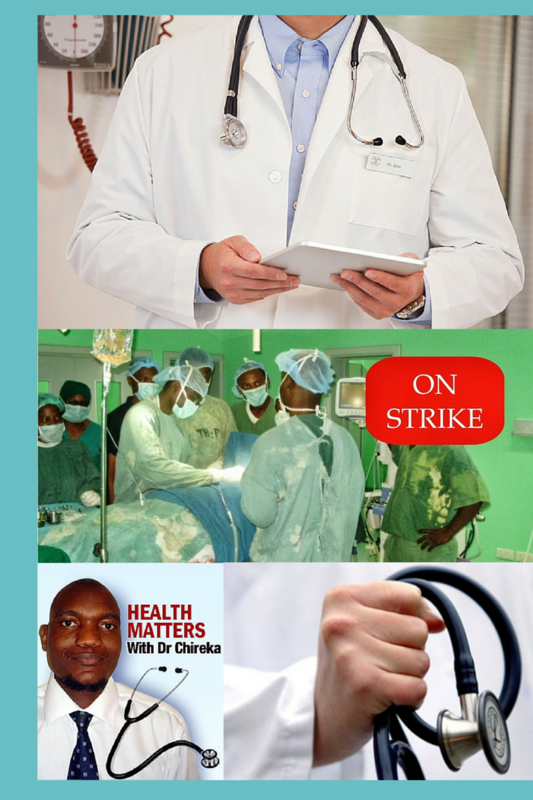 I have read an interesting article by Marika Davies looking at the ethical aspects of strikes by medical professionals around the world. The article looked at several countries in the world like India, Israel , Pakistan, Nigeria , South Africa and the United Kingdom. The general consensus was that emergency care should always be provided during a strike. Arguments have been put forward that strike by doctors contradicted their responsibility to act in the best interest of patients. Others have pointed out that medicine could not function without the financial support and that responsibility for the patient did not rest solely on the doctor. It has also been argued that depriving doctors of proper wages constitutes a breach of contract and justifies a walkout. Therefore, society must take measures to prevent such a situation from occurring. In view of these arguments I find it unfair for the leaders of the ZHDA to be singled out. The whole country should be ashamed that it has let our health system deteriorate to that level and stop using a few doctors as a scapegoat. Frank Frizelle, editor of the New Zealand Medical Journal, said that the short term inconvenience of a strike must be balanced against an improvement in care. “If doctors (and others) truly believe it is important for patient care, then they must sometimes have the courage to do things that are unpopular and difficult,” he wrote. “If the conditions that doctors work under put patients at risk, then (on balance) they are morally obliged to strike.” Should we say then that strike should be allowed if it is going to bring better care for the patients? These are challenging questions that we face as doctors and we expect the public to understand that strike is a last resort in most cases. Other interesting comments came from Nigeria; “Doctors’ strikes have become “a part of normal existence” in Nigeria, said Olufemi Omolulu, a consultant in obstetrics and gynaecology in Lagos. Shima Gyoh, editor of Nigeria Africa Health, said that a strike by health workers was the worst option in the business of negotiating for higher wages. “The pawn is the public, with human lives and limbs as the bargaining chips,” he wrote. He warned that doctors who abandoned their patients were likely to be found guilty of misconduct if tried by the Medical and Dental Practitioners’ Disciplinary Tribunal. But he added that he had not heard of anyone reporting any striking doctor to the Medical and Dental Council on grounds that a patient suffered distress or death as a result of a strike. “Doctors must avoid the temptation of extremism by protecting the weak and the vulnerable during their quarrels with their employers,” he said. Sadly doctors do not control the media and in most cases their grievances are not fully publicised. A lot of focus by the media is on patients’ suffering leaving out how the doctors will be suffering . It will be best to make sure that the views of all stakeholders in a situation are fully publicised for the public to decide who to support. Doctors are seen as uncaring and selfish when it is not the case. Gboyega Ogunbanjo, professor of family medicine at the University of Limpopo in South Africa, said that advocacy, dissent, and disobedience should precede strike action but that when a situation arose that was ethically catastrophic then exit from professional duties could be justified. “In such situations patients are likely to be harmed so the justification . . . must be made on moral grounds,” Ogunbanjo wrote. “The only moral ground is that health care will overall be substantially improved for the greater population. Can strike action by doctors ever be morally justifiable? Yes it can. But always at a cost.” Can we then support the action by the leaders of ZHDA in Zimbabwe and the BMA in the United Kingdom? I await to hear your views on this so kindly email me or post your comments below. Marika Davies also wrote in the article that doctors’ strikes are rare in the United States and went on to highlight that in January 2015 doctors across 10 campuses of the University of California staged a one day strike to protest about resourcing of students’ healthcare. David Kemp, a lawyer and columnist, said that healthcare providers might ethically leave their patients’ bedsides to go on strike only when the benefit of the patient was the ultimate goal and only after all other avenues of negotiation had been exhausted. “If we as a society allow those who care for our sick to abandon their oaths and their duties any more readily than this, then we too have abandoned our sick,” he said. The debate continues unabated as to whether our doctors should go on strike. Is it only the doctors to blame or shall we include governments and the rest of the public? I think we all have a role to play in making sure that we fund our health systems well and make sure that our health professionals are well looked after. We do not want to push kind people to do unkind things so as to get our attention. Remember the only thing necessary for the triumph of evil is that good men do nothing.